Your pet may have experienced one or more skin problems such as flea allergy dermatitis, food allergies, fungal skin diseases, bacterial diseases, auto-immune skin diseases, or skin cancer to name a few. Diagnosing skin problems has an important diagnostic process to ensure that our veterinarians get to the root of the issue. Skin problems can be extremely frustrating for owners because some cases must be managed consistently by follow up appointments and continued treatment with a veterinarian. Ultimately, we want the management and treatment of a chronic skin problem to be of great relief and rewarding for you and your pet. As part of the our comprehensive physical exam, a thorough examination of the eye is routine. All of our doctors are trained to evaluate your pet’s eyes and can diagnose and treat many diseases, injuries, or conditions. The eye is a sensitive organ and problems of the eye can be quite serious. Animals often are challenged with ocular problems that are similar to the eye problems of humans. Although some breeds are more prone to eye problems than others, screening for inherited eye diseases is an essential service that we provide. Please contact our office immediately for an appointment if you notice the following symptoms from your pet’s eyes: squinting, rubbing , swelling, redness, or discharge of the eye. We have a highly experienced veterinary team ensuring that your pet is as comfortable as possible from your pre-surgical visit to your pet’s post-surgical aftercare. As a client, we will reassure you that your pet will receive the utmost attention whether the surgery is a routine surgery or a life-threatening and major procedure. In addition, we also strive to make sure that our patients are in a clean and safe community in order to promote a speedy recovery. We perform a variety of surgeries depending on your pets needs including spays and neuters, tumor removals, declaws, soft tissue surgeries, and orthopedic procedures. Our veterinarians make sure that pain is managed before, during, and after surgeries. Most of our surgeries are followed with a laser therapy treatment in order to promote faster healing and to manage pain. In order to prepare for your pet for surgery, make sure that you remove your pet’s food bowl and water bowl no later than 10:00 pm the night before surgery. 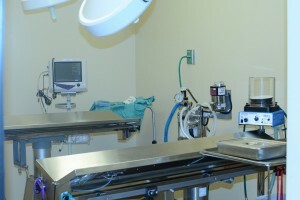 All of our surgical patients must have established a relationship with one of our veterinarians. If your pet is new to our hospital, we will schedule a pre-surgical visit for you and your pet so that any questions may be addressed at that time. Arrive at our hospital between 7:30am and 9:00am to drop off your pet the day of surgery. You are encouraged to call and check on your pet throughout the day if you desire. In addition, one of our team members will keep you informed of how your pet is recuperating and when he or she may be able to go home. In the event that your pet has to be hospitalized at our facility, our veterinarians will keep you up-to-date daily on your pet’s progress. Our patients and clients are always excited when it’s time to go home. Your pet will be discharged with special care instructions while recuperating at home and he or she may be prescribed medications as well. If any complications or difficulty are noted, please contact our office immediately.